Dean David Schaberg has announced that Professor Helen Deutsch will become the new director for the Center for 17th- & 18th-Century Studies and the William Andrews Clark Memorial Library, beginning January 1, 2017. 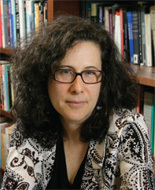 Professor Deutsch joined UCLA’s English department in 1995 and was first affiliated with the Center/Clark as an Ahmanson-Getty Postdoctoral Fellow in 1992–93. She has served the Center/Clark in many capacities over the past twenty-one years, including as Clark Professor in 2005–06, as a member of the Faculty Advisory Committee for many years, and as chair of that committee from 2009–11 and from 2013–15. Beyond Helen’s extensive administrative service within English, which culminated in a term as Vice Chair for graduate studies, and her decades of service to the Center/Clark, she has also successfully spearheaded the founding of UCLA’s interdisciplinary Disability Studies minor, which she chaired from 2006 to 2011. She has also served the profession at a national level, including terms as a member at large of the American Society for Eighteenth-Century Studies, as chair of the Division for Restoration and Early Eighteenth-Century Literature of the Modern Language Association, as an advisory editor for PMLA, and as a member of the MLA Committee on Disability Issues in the Profession. Helen teaches and researches at the crossroads of eighteenth-century studies and disability studies, with particular emphases on questions of authorship, originality, and embodiment across a variety of genres. Her ongoing research questions include the relation of eighteenth-century authors to classical models (in shaping literary style, authorial careers, and gendered identities), the multifaceted connection between physical embodiment and literary form, the interplay between visual and printed cults of authorship and the phenomenon of author-love more broadly considered, and the formative relationship between bodily difference and modern individuality. She is the author of Resemblance and Disgrace: Alexander Pope and the Deformation of Culture (Harvard University Press, 1996) and Loving Dr. Johnson (University of Chicago Press, 2005). With the support of an ACLS fellowship she is currently working on a book on Jonathan Swift and Edward Said, which argues for the pressing importance of eighteenth-century literature to our present moment. Professor Deutsch follows Professor Mary Terrall, who provided outstanding service to the Center and the Clark as the interim director from July through December 2016.